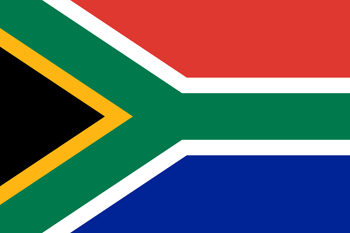 South Africa's new flag was adopted on April 27, 1994. When the new SA flag was chosen it was regarded as an "interim" flag in line with the "interim" constitution through which South Africa achieved full democracy in 1994. Subsequently, a Constitutional Assembly has drawn up a new Constitution (adopted on May 8, 1996 and amended on October 11, 1996) which was enacted by Parliament as Act 108 of 1996. As part of the process in drawing up the new Constitution, the question was asked whether the flag should be retained or a new one designed. The overwhelming response was that the new flag should be retained and is now described in Schedule 1 of the Constitution. The flag was designed by Mr Fred Brownell, the State Herald. It was specifically stated that the colors had no official meaning or symbolism, other their use in the past in flags in this country – red, white and blue from the Dutch and English (British) communities; and black, green and gold from the flags of the liberation movements (ANC, Inkhatha, PAC, etc). The "pall" (Y) does symbolise the convergence and going forward as one unified nation of previously disparate groups in South Africa. The South African flag is one of the most recognisable in the world – but does not yet have a name (like the Union Jack). Any name must be decided by the custodians of the country's national symbols – the Bureau of Heraldry. Before South Africa's first democratic elections in 1994, the country had two anthems - an official and an unofficial one. The official anthem was Die Stem, in English The Call of South Africa. The unofficial anthem, Nkosi Sikelel' iAfrika, was a symbol of independence and resistance to apartheid, sung by the majority of the population and at all anti-apartheid rallies and gatherings. In the official anthem of the new South Africa, the two anthems merge into one. Die Stem van Suid Afrika (The Call of South Africa) - Die Stem van Suid Afrika was originally a poem, written by CJ Langenhoven in May 1918. The music was composed by the Reverend ML de Villiers in 1921. The South African Broadcasting Corporation played both God save the King and Die Stem to close their daily radio broadcasts, and so the public became familiar with the Afrikaans anthem. It was first sung publicly at the official hoisting of the national flag in Cape Town on 31 May 1928, but it was not until 2 May 1957 that the government accepted Die Stem as the official national anthem. In 1952 the English version, The Call of South Africa, was accepted for official use. Nkosi Sikelel' iAfrika - Nkosi was composed in 1897 by Enoch Sontonga, a Methodist mission school teacher. The words of the first stanza were originally written in isiXhosa as a hymn. Seven additional stanzas in isiXhoza were later added by the poet Samuel Mqhayi. A Sesotho version was published by Moses Mphahlele in 1942. Nkosi Sikelel' iAfrika was popularised at concerts held in Johannesburg by Reverend JL Dube's Ohlange Zulu Choir. It became a popular church hymn that was later adopted as an anthem at political meetings, sung as an act of defiance. The first stanza is generally sung in isiXhosa or isiZulu, followed by the Sesotho version. Apparently there is no standard version or translations of Nkosi, and the words vary from place to place and from occasion to occasion.